What was ancient Nazareth like? 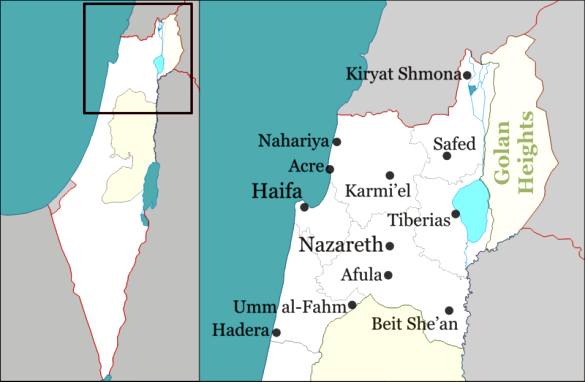 How do we know the size of Nazareth? Roughly how many people lived there? What was the large town nearby? How might it have affected Nazareth? Nazareth is famous for one thing, and one thing alone: it is the home town of Jesus. It was here that Jesus spent his boyhood, living with his mother and father, and here that he faced the sceptical townsfolk of Nazareth. The village seems to have been held in some contempt in 1st century Palestine. It was a nondescript dot on the map with not much to offer, overshadowed by nearby Sepphoris, the luxurious Greek-style capital of Herod Antipas. It is beguiling to think that Joseph and Jesus, as builders, may have traipsed over to Sepphoris to work on the new buildings. 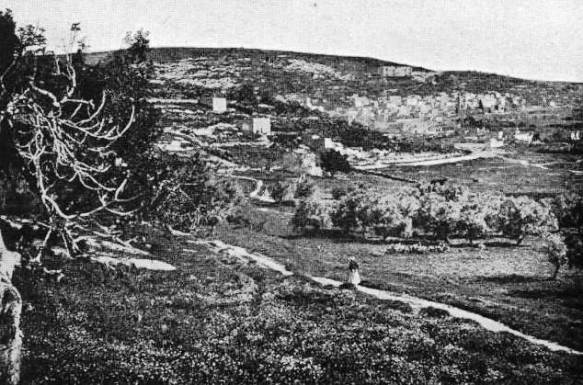 Nazareth lay in the hills twelve miles southwest of the Sea of Galilee: fertile land. Excavations show just how small it actually was – but every bit of space was used effectively. It was built on porous rock, so as well as the buildings above the surface there were underground cisterns for water, vats for oil, and silos for grain. There was a single, ancient spring for water. It was a conservative town, clinging to traditional Jewish culture in a world that had been radically affected by Greek thought and culture. It had a population of about 400, so everyone knew everyone else. The people were physically robust, strong-minded, practical, respectful of traditional and loyal to family. They spoke Aramaic, a language with a strong poetic tradition. Being able to talk well was a valued skill. Young Jewish men were expected to be literate. The Jewish queen Salome Alexandra had made reading and writing compulsory for all Jewish boys – for study of the Torah. Nazareth was small. We know this because of the discovery of underground tombs. These were chiseled into the soft limestone bedrock, and their position shows the limits of the village’s perimeter to the west, east, and south, since burial was always done outside inhabited areas. It would have been 2,000 feet at its greatest east-west length and around 650 feet at its greatest north-south width, though the actual area inhabited in the first century was much less, perhaps only around ten acres. Steep ravines and ancient terraces on the northern slope confined the oval-shaped settlement. The people of Nazareth were essentially farmers, so they needed space between the houses for livestock and their enclosures, as well as land for plants and orchards. Nazareth would have had a population of around two to four hundred in antiquity, that is to say, several extended families or clans. The tombs surrounding Nazareth were also very modest. Each of them was typically Jewish. The body was first buried in a body-length shaft cut at right angles into the walls of the tomb chamber, sealed with a large stone rolled into place. When the flesh had decayed, the remaining bones were gathered together and usually placed in an ossuary or bone box. 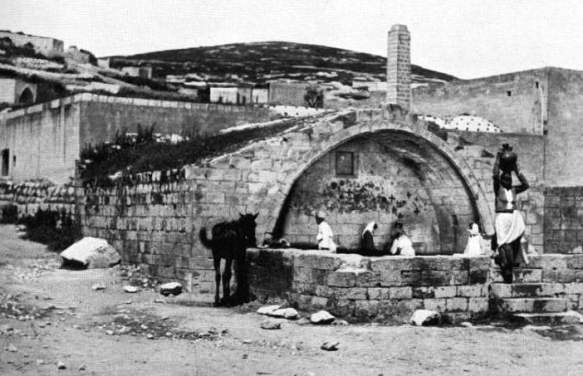 Ritual bathing pools or mikveh were also found at Nazareth. Used for ritual-purity immersion, they were found at virtually every Jewish site in Galilee, the Golan, and Judea. The little village of Nazareth, off the main road, over the hill but still within walking distance of the city of Sepphoris, was Jesus’ home. The peasant families who lived there eked out a living, paid their taxes, and tried to live in peace. They were observant Jews, so they circumcised their sons, celebrated Passover, did not work on the Sabbath, travelled as pilgrims to Jerusalem, and valued the traditions of Moses and the prophets. The only feature in the present-day town of Nazareth that can be linked directly to Jesus is the well. The actual structure is probably later, but we can stand in front of it and know that in that spot Mary once hauled water each day for her family’s needs. 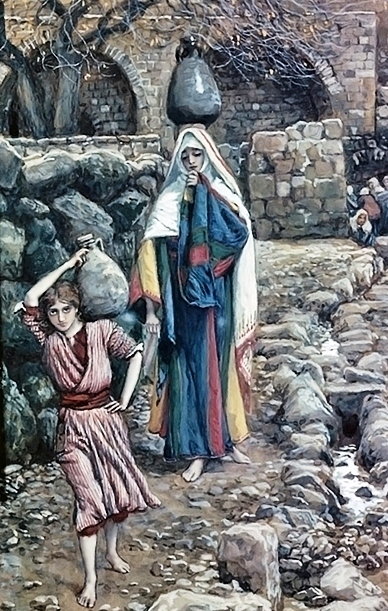 This event was depicted in James Tissot’s ‘Jesus and His Mother at the Fountain’ (above) — though it is historically unlikely that a grown boy would have taken part in what was seen in 1st century Palestine as women’s work.